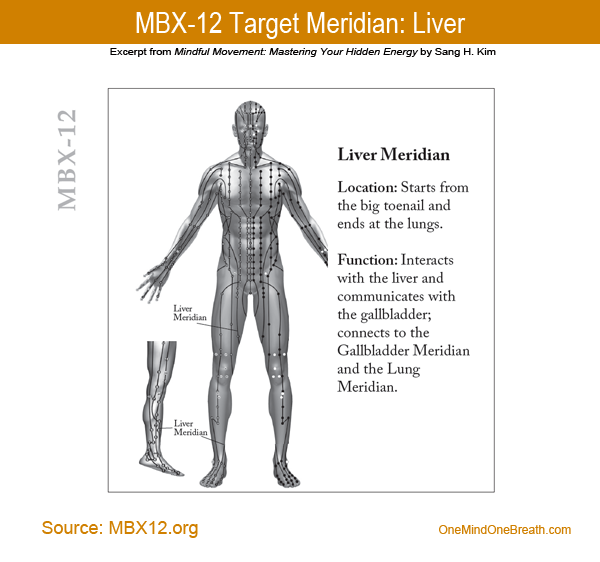 Unity Posture, the 12th posture of MBX-12, is the most challenging movement because you stand on a single leg. 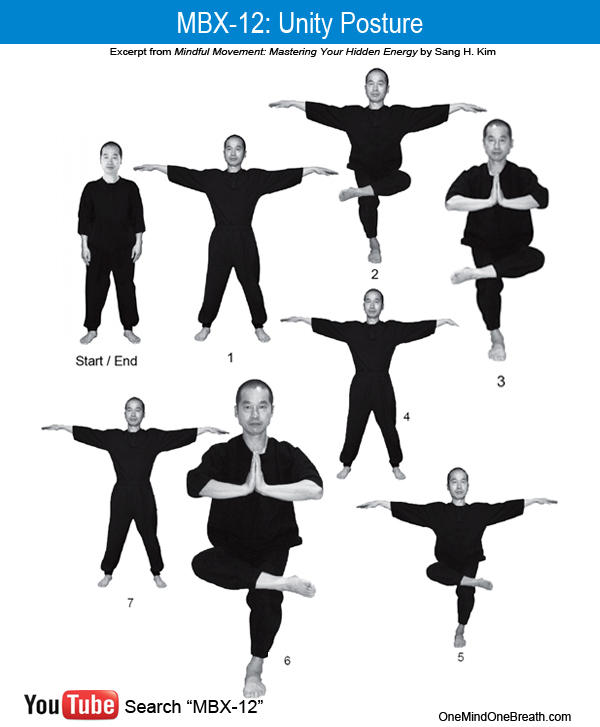 You also perform multiple movements during the single leg standing: raising your arms sideways and placing one ankle on the knee while bending your standing knee and exhaling. But if you do one movement at a time, very slowly, it becomes a rewarding experience. The key is developing your internal awareness of the changes in your body so that you can better control your body. The irony of controlling is that to control your body, you have to go along with the flow of the body and how you feel in the moment. Imbalance often results from a sense of momentary awkwardness. It comes from a physical instability such as unstable placement of your feet, misaligned torso and head positions, noise, visual or mental distractions. The more you try to regain your balance, the less you feel successful. In that case, just start over. For your safety and joy of learning. Through repetition, however, you become comfortable with the unfamiliar feeling of standing on one leg and the multiple steps of the sequences of the movement. In time, you will feel more confident, relaxed and balanced. If necessary, you may use a chair to support you and enhance your balance. 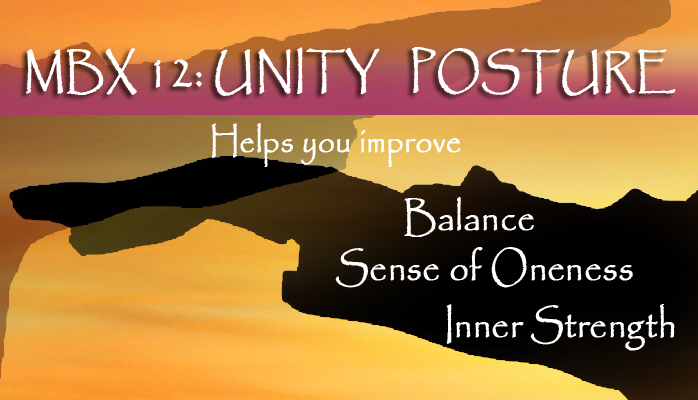 MBX-12: Unity Posture promotes inner strength, balance, and a sense of oneness. From natural stance, raise your arms sideways and inhale. Place your left upper ankle above your right knee and gently bend the standing leg. Keep your arms open. Exhale. Inhaling, bring your hands to the front of your chest. Exhaling, gently bend your standing knee. Hold this position for 5-10 seconds. Place your left foot on the ground, raising your arms. Inhale. Place your right upper ankle above your left knee and gently bend the standing leg. Keep your arms open. Exhale. Place your right foot on the ground while raising your arms. Inhale. Return to natural stance. Exhale. Unity Posture stimulates the Liver Meridian, which begins from the big toe, ascends through the inner thigh and the lateral torso, and arrives in the liver. 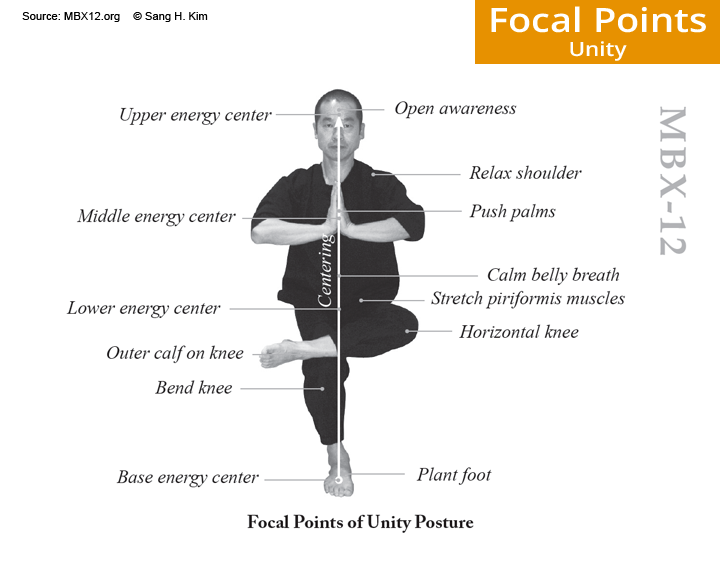 Unity posture connects 4 points in the vertical plane: the foot, the lower, middle and upper energy centers. Centering is the key. Stand low and hold your praying hands in the middle of the chest for balance. Keep your torso upright and push your hip slightly backward until you feel a stretching sensation in the piriformis muscles that run across the hips. This entry was posted in MBX-12 Workshop, MBX12, Mindful Movement and tagged Centering, Chi, Energy, Equilibrium, How to Boost Energy, Inner Strength, Invigorate, Ki, Liver Meridian, Prana, Sense of Control, Sense of Oneness, Unity Posture. Bookmark the permalink.